A bike share rental was brought over five miles into the wilderness to a new home at the top of Mailbox Peak. 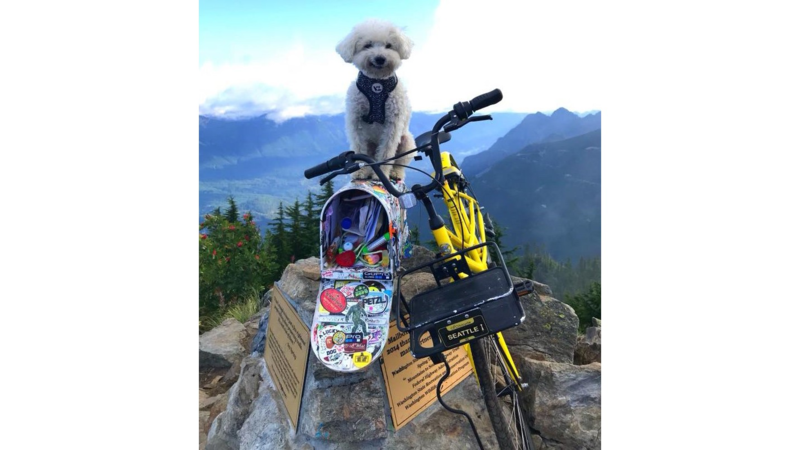 Mailbox Peak is famous for its mailbox filled with gifts and trinkets, but the mountain recently got a unique addition: An Ofo bikeshare bicycle. Kristen Fox-Hill posted a Facebook photo Monday of the bright yellow bike leaning against the mailbox at the top of the peak. She wrote she didn’t carry it to the top, but she had to get a picture with it and her dog Largent. Dockless bikeshare rentals, which can be unlocked using a smartphone and left virtually anywhere, have been notorious for showing up in unusual locations. The bikes have been spotted strewn across alleyways, at the bottom of lakes, and at remote trailheads. Mailbox Peak is about 40 miles east of Seattle, and the hike is a grueling endeavor – the new trail is 11.2 miles round trip with 4,100 feet of elevation gain, according to the Mountaineers. Some members of the group spoke out against bringing the bike to the top of Mailbox Peak, because it violates Leave No Trace principles, which aim to preserve nature and prevent deterioration from hikers. “If everybody were to behave in that way…the outdoors would be trashed pretty quickly,” Jacobson said. Even without the bike, Jacobson acknowledged the mailbox and goodies at the top of Mailbox Peak presents an issue to the Leave No Trace principle in general, but most hikers accept it as an exception. Jacobson said that he hadn’t heard of anyone planning to bring the bike down but was confident someone would take on the challenge. “I am certain we will have someone go up and get that out of there at some point,” he said. The owners of this particular bike – Ofo – pulled their operations out of Seattle in August after Seattle City Council imposed a $250,000 annual fee on bikeshare companies. Ofo planned to donate bikes to nonprofits as operations winded down.